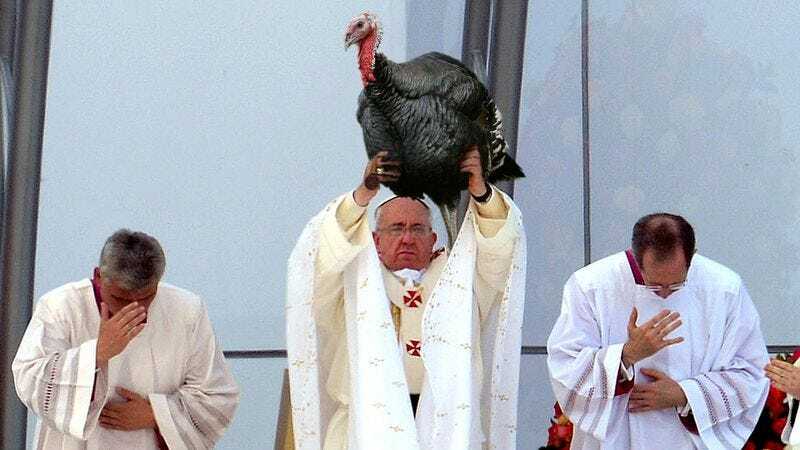 VATICAN CITY—Declaring the 10-pound bird worthy of the church’s veneration to a crowd of thousands in St. Peter’s Square, Pope Francis celebrated a hallowed tradition on Thursday by canonizing a turkey from a local farm, a Thanksgiving ritual dating back more than three centuries to the pontificate of Innocent XII. “Dear brothers and sisters, it is my deepest joy today to present the life and witness of this humble bird to the Church and welcome him to cluck and cackle among the saints in God’s Kingdom of Heaven,” Pope Francis recited in accordance with the teaching of the Second Vatican Council, invoking the name of God three times before inscribing the newly beatified bird, named St. Gobbler, in the catalogue of saints. “Like those who came before, this pure and simple bird lived a life in consecration of Christ the Lord, his gentle gobbles spreading goodness and grace throughout Applewood Farms. May this noble and dignified bird forever bear witness to the Glory of God on earth and shine light in the hearts of the faithful on this most holy day.” Vatican sources say the ceremony was far less controversial than last year’s posthumous canonization of St. Wattle, a 23-pound wild turkey who was burned alive as a heretic in 1690.